All of you who’ve purchased my new CD Harvey will have found a hand drawn map in the centre of the cover and I though it was worth giving a bit more of an explanation of some of the places on the map and what they meant to me. 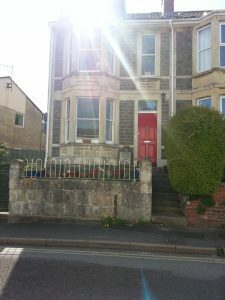 Queenwood Avenue: I grew up at 25 Queenwood Avenue , a small terraced house on a very steep hill. My grandparents (On my Fathers side) lived at number 29 so we saw lots of them whilst growing up, and also two other relatives ( Great Uncle and Aunt) on the opposite side of the street. In those days you knew and spoke with all your neighbours, and it was a very friendly community. 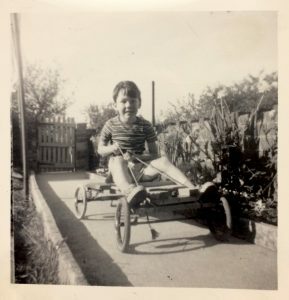 My best friend Colin and his Sister Josie lived at the top of the street in Evelyn Terrace , and although the house is still there a road runs through the Garden we used to play in. I kept in touch with Colin and still meet up for a drink with him when I am able to. 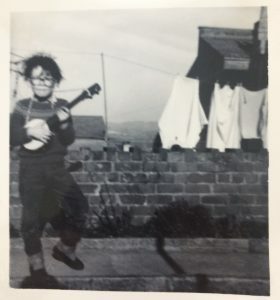 My First musical adventures took place in back garden of Queenwood Avenue , where I used to do a Freddie and the Dreamers impersonation with shaggy wig and ukulele banjo. Not sure it’s a great look ! George’s Hill: At the top of the back lane behind the houses there was a gravel road leading to the Green , a small area of trees where we built dens, climbed trees and used to have battles throwing stones at each other ( Perhaps not the most sensible option).Leading down into the green was Georges Hill a steep stone and gravel road and there we used to race karts made from old prams, trying to stop at the bend at the bottom without falling off or crashing into anything.Again this seemed like great fun at the time, but in hindsight with no protection perhaps wasn’t the safest hobby although I don’t remember any major injuries , just lots of minor ones. The Woods and the Common: Many evenings were spent heading up through the woods to The Common on Beacon Hill, where we would play football ( Soccer) or play on the swings and roundabout which were there. We stayed out until it was starting to get dark before heading home through the woods. I guess these days kids miss out on the opportunity to have this much freedom, as it is considered too un-safe. 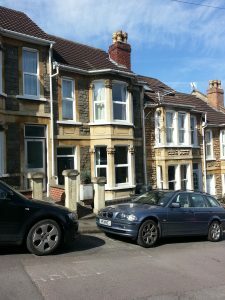 Final mention is of Perfect View which was at the bottom of the woods and a small terrace of houses which had the best view over the City of Bath and as we got older we used to go down there and sit and walk into town. Sadly I went back there recently and a row of trees was planted 20 years ago after a planning dispute and this now cuts out most of the view which is a great pity . Maybe one day a man with a chainsaw will restore this view to its former glory.